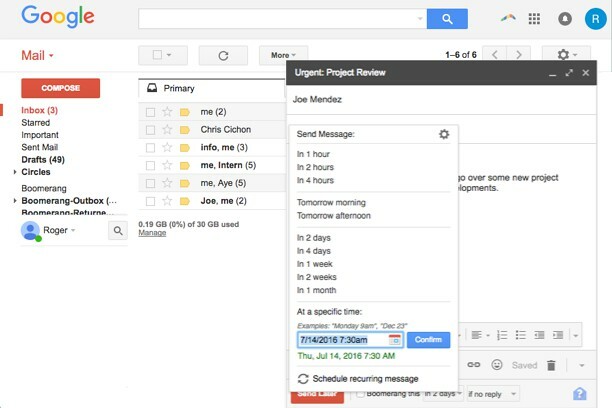 Hundreds of thousands of Gmail™ users count on Boomerang for easy, integrated scheduled email sending and reminders. The service allows you to schedule emails to automatically send in the future, so you can write an email now, and the service will send it tomorrow morning at 6 AM, or next week while you’re at the beach, without you needing to be online. Boomerang also helps you to postpone incoming emails, by making them disappear from your inbox into a folder or label, then bringing them back to the top of the message list at the specified time. It helps you keep your inbox clean, without losing track of important messages. Boomerang is also the only reminder service that can alert you if you do not get a reply to a message. We only use the Management permission to remove older versions of the extension that conflict with the latest version. Check background.html if you would like to verify this! 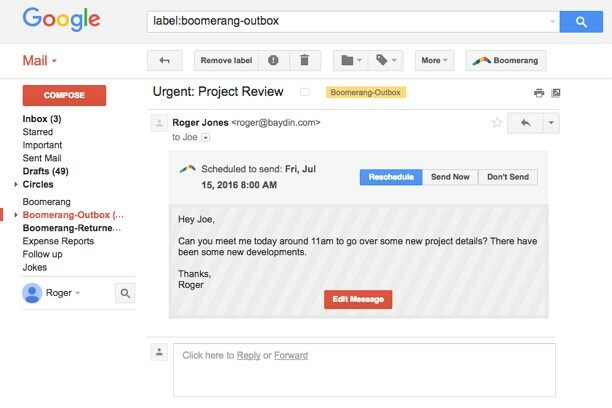 "Boomerang is my missing piece for Gmail - absolutely the best thing that happened to my inbox in recent months!" "Just got your Boomerang addon for Gmail -- it's the best thing ever. EVER!" 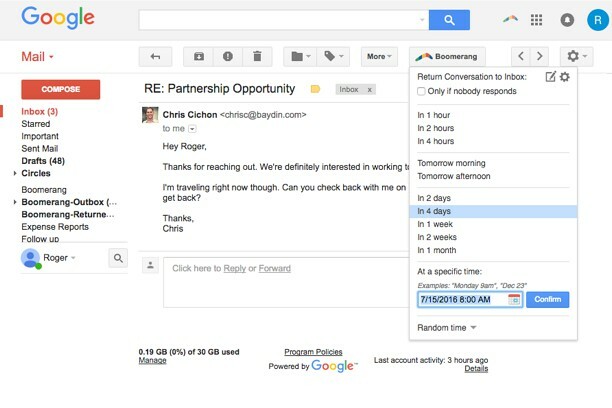 "Falling in love with Boomerang for Gmail. VERY easy for helping you remember to follow up on offers sent out etc"